Promotional Translucent Riviera Sunglasses are available in Blue, White, Orange and Green color options. They have a total size of 6"l x 6"w x 2"h and fits most head sizes. Presented in a trendy unisex design, these custom Oahu sunglasses are loaded with UV400 lenses to give users an extra protection for their eyes while in the outdoors. Capable of delivering 100% UVA and UVB protection, these custom new arrival sunglasses are smart and trendy. 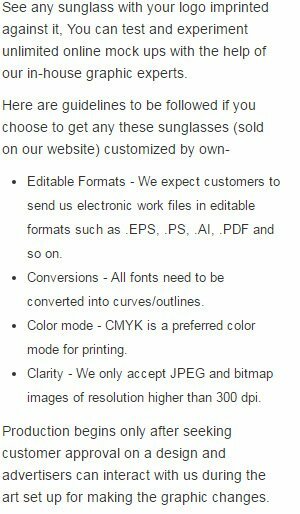 Order these printable sunglasses with Blue lenses right now to earn free artwork design, free online proofs, and best price guarantee offers. Request a quote to know what you can save on ordering these Promotional Translucent Riviera Sunglasses in bulk. Features : Lense are UV400 to provide 100 percent UVA/UVB protection, Trendy unisex design.